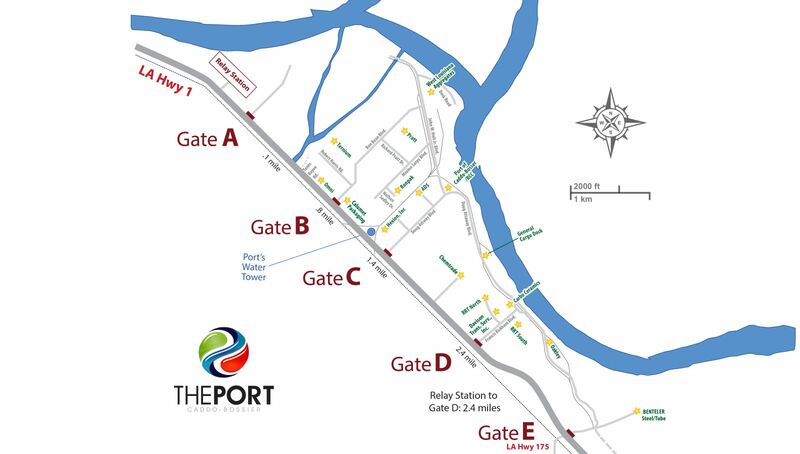 The Port of Caddo-Bossier’s general cargo dock and administrative offices are easy to find and are located on LA Hwy 1 just four miles south of the City of Shreveport. Click Here for printer-friendly version of the gate map. From I-20, exit onto I-49 South. From I-49, exit onto 3132 East (Inner Loop Expressway) at Exit 201. Proceed on 3132 east until it ends at Flournoy Lucas Road. Turn left on E. Flournoy Lucas/LA 523. Turn right onto Youree Drive/LA Hwy 1. Continue to Francis Bickham Boulevard (Port truck entrance). This road is approximately 1 mile south of the Port water tower, which is visible from Hwy 1. Turn left. Proceed on Francis Bickham until the road reaches a dead-end “Y”. Turn left. Upon immediately approaching another stop sign, turn left again on Doug Attaway Boulevard. The Port dock is located just past the blue warehouse building on your right. From I-20, exit onto 3132 East at Exit 11. Turn right onto Youree Drive/LA Hwy 1. Continue to Francis Bickham Boulevard (Port truck entrance). This road is approximately 1 mile south of the Port water tower, which is visible from Hwy 1. Turn left. Proceed on Francis Bickham until the road reaches a dead end “Y”. Turn left. From I-49, take exit 196 for Southern Loop. Turn right onto Southern Loop. Continue on Southern Loop for approximately 2.2 miles, to Norris Ferry Road/Par Rd 155. Turn left. Continue down Par Rd 155 to the intersection of Par Rd 155 and Overton Brooks Road / Par Rd 118. Turn right. Follow Overton Brooks Road / Par Rd 118 to Ellerbe Road / Par Rd 26. Turn right. Take Ellerbe Road / Par Rd 26 to Leonard Road. Turn left. Follow Leonard Road all the way to Youree Drive/LA Hwy 1. Turn right onto Youree Drive/LA Hwy 1. Upon departing the Airport at the traffic signal, continue straight on Monkhouse Drive until the intersection of I-20. Cross over the interstate, turn left and merge onto I-20 West. Immediately after getting onto I-20, take the 3132 East exit. Proceed on 3132 East until it ends at Flournoy Lucas Road. Turn left on E. Flournoy Lucas/LA 523 and follow to Youree Drive/LA Hwy 1. U.S. 71 and LA. Hwy 1 become the same highway upon entering Shreveport. Exit Hwy 1 onto I-220 West. I-220 will become LA 3132 upon crossing I-20. Continue on 3132. Turn right onto Youree Drive/LA Hwy 1. Drive approximately 4 miles to Doug Attaway Boulevard, the first road past the water tower. Turn left. Proceed on Doug Attaway Boulevard until the road reaches a dead end “Y” in front of the Regional Commerce Center. There is parking in front, or you can take a left on John W. Holt Boulevard and take your second right for additional parking. Turn right onto Youree Drive/LA Hwy 1. Drive approximately 4 miles to Doug Attaway Boulevard, the first street past the water tower. Turn left. Continue down Par Rd 155 to the intersection of Par Rd 155 and Overton Brooks Road/Par Rd 118. Turn right. Follow Overton Brooks Road/Par Rd 118 to Ellerbe Road/Par Rd 26. Turn right. Take Ellerbe Road/Par Rd 26 to Leonard Road. Turn left. Follow Leonard Road all the way to Youree Drive/LA Hwy 1. Turn right. Continue to Doug Attaway Boulevard, the first street past the water tower. Turn left. Turn right onto Youree Drive/LA Hwy. 1. Drive approximately 4 miles to Doug Attaway Boulevard, the first street past the water tower. Turn left. U.S. 71 and LA Hwy 1 become the same highway upon entering Shreveport.